Italian conductor who gained international recognition for leading the Chicago Symphony Orchestra and the Orchestra Giovanile Luigi Cherubini. He led performances of "The Marriage of Figaro," which was written by Mozart, for the Vienna State Opera. He studied classical piano at the Conservatory of San Pietro a Majella prior to becoming a conductor. He was trained by such notables as Bruno Bettinelli, Antonino Votto, and Nino Rota. 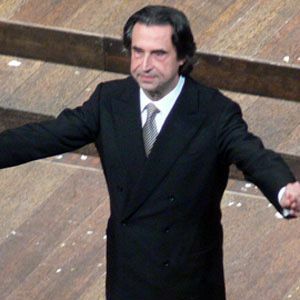 He received two prestigious awards in 2011, the Birgit Nilsson Prize and the Prince of Asturias Award. He was born to a father who was a physician and amateur singer and to mother Neapolitan who was a professional singer. He fathered three children with wife Maria Cristina Mazzavillani. He replaced Otto Klemperer as the conductor of London's Philharmonia Orchestra in 1974.